Use Long Tail Keywords to Help Short Tail Keyword Ranking – Bellrock Internet Marketing Sedona magazine. More articles on digital marketing are available to learn from in our free monthly eZine BellrockClicks. Why not get your copy of our free monthly marketing eZine by subscribing on the form on this link. [soundcloud url="https://soundcloud.com/user-784462302/use-long-tail-keywords-to-help-shot-tail-keyword-ranking"] Do not ignore the highly competitive short tail keywords on your website. Just use patience and your long tail keywords to help you rank better on the short tail keyword phrases. Find additional internet marketing tips by checking out the articles in our free monthly Bellrock Clicks magazine. More articles on digital marketing are available to learn from in our free monthly eZine BellrockClicks. 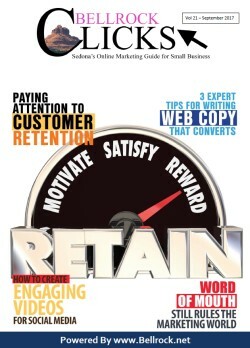 Why not get your copy of our free monthly marketing eZine by subscribing on the form on this link. What Is the Best Tool for Marketing a Travel/Tourism Business?